To make cupcakes, divide the batter among 12 paper-lined muffin cups; bake for 20-25 minutes, or until springy to the touch. 1Preheat the oven to 350F. In a large bowl, stir together the flour, sugar, cocoa, baking powder, baking soda and salt. In another bowl, whisk together the buttermilk, oil, brown sugar, eggs and vanilla. Coarsely grate the beets using the large-holed side of a box grater. 2Add the wet ingredients to the dry ingredients along with the grated beets and stir just until combined. If you like, stir in the chocolate chips. 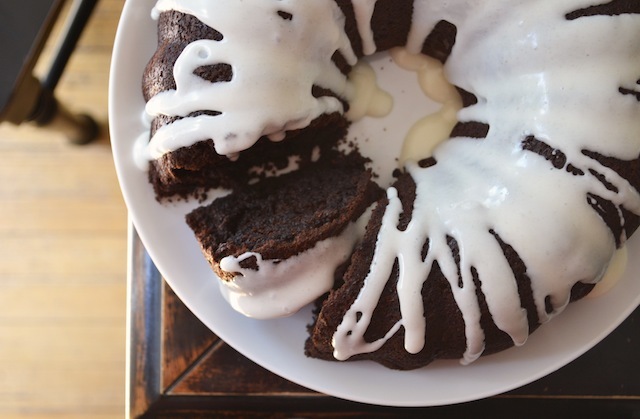 3Pour into a well-greased Bundt pan and bake for an hour, until the top is cracked and springy to the touch. Let cool for about 20 minutes before turning out onto a wire rack to cool. To make the cream cheese drizzle, whisk together the cream cheese, icing sugar and milk, adding a little extra milk or sugar as needed to achieve a pourable consistency. Drizzle over the cooled cake.